The Jews Are Going to Florida – So What’s New? 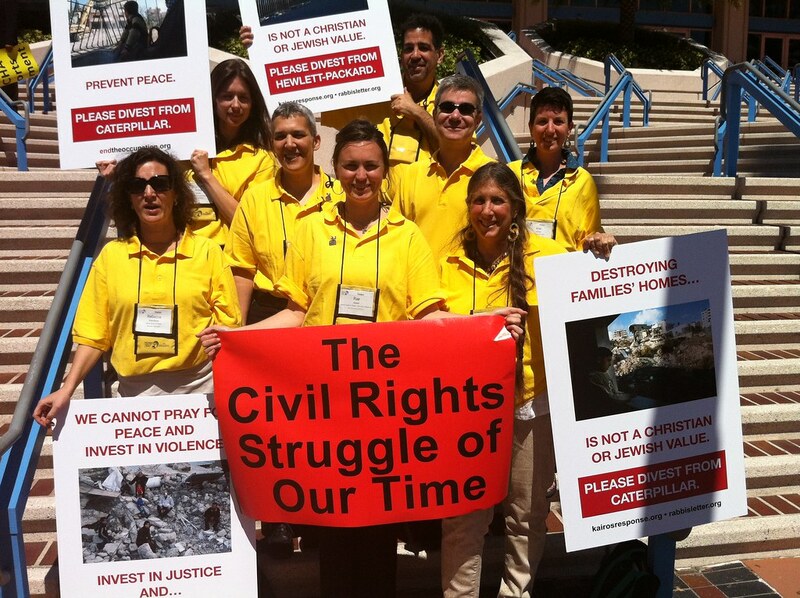 This is the second of a three-post series from Jewish Voice for Peace volunteer youth activist members on the ground at the United Methodist general conference leading up to the divestment vote. The second post is from Rae Abileah. -ed. On Tuesday morning just as the sun rose over the Keys, I touched down in Tampa, Florida to join a team of volunteers and organizers working to support a United Methodist resolution for church divestment from three companies that profit from the Israeli Occupation: Caterpillar, Motorola Solutions, and Hewlett-Packard. Walking into the Tampa Convention Center only hours later, I asked myself, “What am I, a Jew, doing at this conference, and can I make a difference?” 72 hours later, I know exactly why I’m here. “This action by Methodists to align words with action could really be a boost for all of us that support a just, sustainable resolution in the Middle East,” Cindy Corrie tells me in between grabbing a handful of flyers and dashing out the door. Cindy is the mother of Rachel Corrie, the 23-year-old woman from Oregon who was killed by a Caterpillar bulldozer when it crushed her as she stood between it and a Palestinian home in Gaza in 2003. Years later, unwilling to see their daughter’s death be in vain, Cindy and her husband Craig have become outspoken advocates for peace and human rights in Israel and Palestine. Now here we are, together, advocating for this divestment resolution. Destroying homes is not a Jewish value, and that’s exactly what Caterpillar’s weaponized bulldozers are doing in the West Bank. Defending stolen property is not a Jewish value, yet Motorola Solutions provides surveillance systems for Jewish-only illegal settlements. Discrimination is not a Jewish value, but Hewlett-Packard provides a biometric ID system in Israeli checkpoints in the occupied West Bank which deprives Palestinians of the freedom of movement. The actions of these companies are in direct contradiction to the Jewish values that I was raised with, so divestment is a logical, nonviolent, important action to support. Not only are these tools of occupation immoral, but they also actually harm Israelis. The unjust decades-long treatment of millions of Palestinians is a major cause of the violence and resistance that makes Israelis feel less secure. Ending Israel’s mistreatment of Palestinians isn’t just about Jewish values, it’s also about ensuring security and safety for both peoples. Today the 13 members of Subcommittee 2 (of 4) to the Financial Administration Committee debated the resolution. Some delegates wanted to invest in the Palestinian economy rather than divest. But we know that to truly invest in peace is to divest from occupation. No economy can prosper without freedom of movement for workers and goods, reliable and affordable water, or access to markets, land and raw materials. The occupation denies all these to Palestinians. As long as United Methodist investments are helping to sustain the occupation, and thereby strangle the Palestinian economy, putting more money into businesses there can do little to help. Investment in Palestine may sound “positive,” but it turns a blind eye to the reality of the occupation and the suffocating effect it has on Palestinians’ lives and economy. Overwhelmingly, we’ve received a positive response when talking with delegates in the halls of the convention center. In numerous conversations delegates have expressed gratitude and interest in hearing from me as a Jewish person. Yesterday Kairos Response held a delegate luncheon featuring two keynote speakers – Palestinian Christian Daoud Nasser and Israeli Dr. Dalit Baum. The lunch was so popular that it was standing room only and exceeded the room’s capacity. Many African delegates are making the connection between the urgent need to divest from the Occupation and the church’s past history of divestment from Apartheid South Africa. Being at this diverse conference feels like a mini-U.N., and like the U.N it is full of people who support human rights. This afternoon UM Kairos Response is hosting a celebratory reception with indigenous Palestinian Christians. Several of the speakers have traveled over 6,000 miles to be a witness for peace at this conference, including Rev. Alex Awad of Bethlehem Bible College and Zahi Khouri, Chairman of the Coca Cola Company in Palestine. Khouri was interviewed on the powerfully honest 60 Minutes segment on Palestinian Christians this past Sunday. Since airing the piece, 60 Minutes has been under attack by supporters of the Occupation who are appalled at this frank telling of the truth. Jewish Voice for Peace is gathering signatures on a thank you letter to 60 Minutes. Stifling the truth and silencing dissent is personal for me. Earlier this spring, I found out that a panel I was scheduled to speak on at the Jewish Library in San Francisco was cancelled because I was a panelist. Why? Because I work with organizations – CODEPINK and Jewish Voice for Peace – that support the boycott of illegal Israeli settlement products and Occupation profiteers. The Jewish Federation threatened to withhold funding to the Library and the event was cancelled, and we panelists and organizers with Progressive Jewish Alliance and Workmen’s Circle responded with an open letter. Luckily we’ve rescheduled this event at a synagogue nearby, and the panel will go on. When will the next attempt to shut out differing opinions be made? We often say “two Jews, three opinions,” but it seems in the current McCarthy-like climate in the Jewish community, opinions are only welcome when they conform to the status quo. It’s been a long week here in Tampa, and I’m looking forward to bringing in Shabbos this evening. Our success here at the Methodist Conference will not be determined by whether this resolution is passed or not. Indeed we have already had a great success in bringing the conversation and awareness of the Israeli Occupation to the leaders of a community of over 8 million people worldwide. Our success lies in our ability to act in integrity with our faith and speak out against systemic injustice and segregation. Sometimes when I talk with Cindy I feel suddenly speechless, unable to imagine the unnatural pain of a mother losing her young daughter. Rachel and I share several things in common – our first names, for starters. Rachel would be around my age if she were still alive today. And Rachel’s passionate belief in freedom and dignity for Palestinians, for all people, burns brightly in me too. There are thousands of young people, other Rachels, Sarahs, Fatimas, Mohammads, that have been killed in this conflict. The work we are doing here at the United Methodist conference is done in memory and respect of those lives lost, and with steadfast hope and faith in a better future, one of equality, freedom, and justice for all people. For more info on Jewish support for the Methodist church divestment resolution, please visit www.rabbisletter.org and www.kairosresponse.org and follow us live from Tampa @jvplive and @raeabileah. Rae Abileah is a founding member of Young Jewish Proud, the youth wing of Jewish Voice for Peace. She is a Jewish American of Israeli descent and has visited Israel, the West Bank and Gaza. Her work in the Jewish community has included projects with American Jewish World Service, Wilderness Torah, B’nai Brith Youth Organization, Hillel, and various synagogues. She currently works as the national co-director of CODEPINK Women for Peace. She is a contributing author to several books including Beyond Tribal Loyalties: Stories of Jewish Peace Activists and Beautiful Trouble: A Toolbox for Revolution. She lives in Berkeley, CA, and can be contacted at rae@codepink.org.